Election for the new office bearers of the Karnataka Arya Vysya Mahasabha was held very recently. 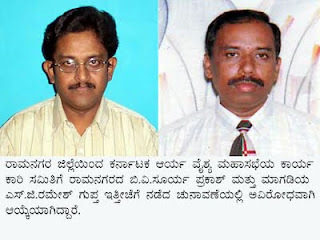 B.V.Surya Prakash from Ramanagara and S.G.Ramesh Guptha from Magadi were elected unanimously from Ramanagara District. The newly elected are the first to represent Ramanagara District in Karnataka Arya Vysya Mahasabha as Ramanagara District came into existance just two years ago.